Guangdong won the CBA championship with a 103-94 victory over Xinjiang in a game that was not as close as the final score indicated. After leading 26-20 after one quarter and 49-45 at the half, Guangdong broke the game open in the third quarter to take an 81-60 lead. Zhu FangYu (201-F-83) led the way with 29 points and 4 rebounds. Wang Zheng had an excellent game with 14 points on 6 of 7 shooting and 10 rebounds, but he fouled out in 15 minutes. David Harrison had 12 points and 15 rebounds. Zhou Peng had 12 points, 4 rebounds and 3 assists. Du Feng had 11 points and 3 rebounds. Wang Shipeng scored 8 and Smush Parker had 6 points, 6 rebounds and 5 assists. Charles Gaines had 30 points and 11 rebounds for Xinjiang. Myron Allen had 17 points, 3 rebounds, 4 assists and 6 steals. Xirelijiang had 17 points, 4 rebounds and 4 steals. This young Uighur guard, listed as born in 1991, right now looks like the most promising of China's young guards, surpassing Guangdong's Liu Xiaoyu and the oft-injured Chen Jianghua. Xu Guozhong had 13 points and 5 rebounds for Xinjiang. Mengke Bateer had 9 points, 4 rebounds and 3 assists. 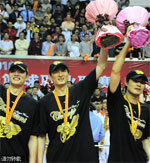 CBA all-star game of season 2009-2010 was on last night in Bei Jing. Northern team beat Southern team at 133:121. Zhang Qing Peng from Liao Ning team scored 29 points with 7 3-points. 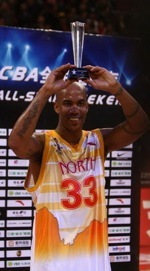 Stephon Marbury received 30 points, 10 assists, 6 3-points and 3 steals. Yang Ming got 6 points, Li Xiao Xu got 11 points, Ba ter got 2 points. From South team, rodney White lead the team with 32 points and 9 boards. John Lucas got 30 points, 6 3-points and 6 rebounds. Wang Zhi Zhi got 12 points and Yi Li got 4 points. Liu Wei got 11 points and Gong Song Lin got 16 points. The headcoach from north team is Jiang Xing Quan and assist coach is Guo Shi Qiang, but the whole game was coached by Guo. Headcoach from South team is Li Chun Jiang and assist coach is Wang Fei. North team recieved the score at each quator is 28points, 29points, 33points, 43 points and south team got at 31points, 27points, 28points, 35points. Point Guard: Hu XueFeng (185-G-80) -Jiangsu. Point Guard: Zhang QingPeng (189-G-81) -Liaoning. Hu XueFeng has broken the index finger in his left hand, and announced that he will sit out the rest of this season, so he will need to be replaced. This also hurts Jiangsu's prospects in the playoffs. The coaches of the 17 CBA teams also voted to pick their teams for the Rookie Challenge, to be played March 19.